Oil Color: A deep reddish resin color. In the Imp (ITI): Strong jasmine, like hit-you-in-the-face jasmine, and myrrh. Mind so, I like jasmine, so this isn’t a bad start to the scent. Wet: Again, thick jasmine, some myrrh, and just the impression of rose. Dry: Jasmine and rose, but the myrrh has died down a bit. It’s a womanly scent. Scent Description and Notes: “Elizabeth Báthory, also called Erzsébet Báthory in Hungarian and Alžbeta Bátoriová-Nádašdy in Slovak, was the Bloody Lady of Hungary. In order to preserve her youth and loveliness, the brutal and incomparably savage countess captured, tortured and slaughtered innumerable young women and bathed in their blood as part of her beauty regimen. Ah, vanity. Oil Color: Too little to tell. In the Imp (ITI): Rose, opium, berries, lilac, and plum. It’s yummy while still being complex enough to be worn by an adult. Wet: Gardenia, crushed roses, plum, and artificial berries. It’s now bad, actually. Dry: Mmm, now it smells like berried fall potpourri The plum is evident while the berries smell dried rather than wet and artificial (thank you, BPAL!). The rose and opium meld wonderfully together to form a complicated and womanly scent that I would love to wear again. Scent Description and Notes: “It was always spring in her forest, because she lived there, and she wandered all day among the great beech trees, keeping watch over the animals that lived in the ground and under bushes, in nests and caves, earths and treetops. Generation after generation, wolves and rabbits alike, they hunted and loved and had children and died, and as the unicorn did none of these things, she never grew tired of watching them. Oil Color: A honey color, straight from the hive. Bottle Design and Artwork: This is a standard vial / imp size (1/32 oz). The label wrapped around the bottle features an Art-Deco inspired Phoenix with the the name of the company at the right-hand side of the label. The other side is a bit different since this is an imp specifically from a special collection. It features the words in a grey color that read “Peter S. Beagle’s The Last Unicorn” at the very top. Just below that in a kelly green field box is white text that features the name of the scent. Along the outermost side, written down the side is the web address of BPAL. 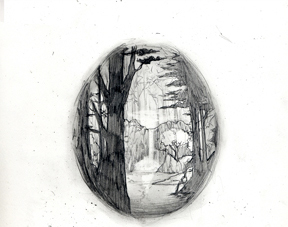 The image is a beautifully rendered pencil drawing in a oval of the woods in which the last unicorn dwelt. In the Imp (ITI): Strong lilac, something slightly aquatic, and grass. It’s interesting, but there is the aquatic bit that keeps me from loving it. Wet: Strong, aquatic notes swirl around the violets drowning out nearly everything else save the musky undertones. Dry: I get more grass and some additional flowers, but lilac and the aquatic aspect are still the strongest notes. It’s not something I wear again, sadly. Oil Color: A bright coppery yellow. Bottle Design and Artwork: This is a standard vial / imp size (1/32 oz). The label wrapped around the bottle features an Art-Deco inspired Phoenix with the the name of the company at the right-hand side of the label. The other side is a bit different since this is an imp specifically from a special collection. It features the words in a grey color that read “Peter S. Beagle’s The Last Unicorn” at the very top. Just below that in a kelly green field box is white text that features the name of the scent. Along the outermost side, written down the side is the web address of BPAL. 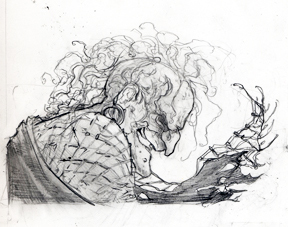 The image is a beautifully rendered pencil drawing Mommy Fortuna smiling malevolently as her tattered shall flutters in the wind. This is probably one of the most unsettling of the Last Unicorn images. In the Imp (ITI): This reminds me of some of the Phoenix Steamwork scents. It smells like bronze, oil, ozone, and honey. Wet: It’s very similar to the ITI scent, but the honey is turning to fake, artificial honey on my skin. I’m now getting a little gunpowder over the heavy metal and ozone notes, but less so with the oil I originally smelled. Dry: Whoa, now the gunpowder is the most dominate note, followed by the bronzed metal and a touch of honey. It reminds me of Roman armor. Shoot, petitgrain – one my my skin’s scent nemises. I hope it gets balanced out by the rest of the notes. Oil Color: Sweetly and darkly resinous with an orange warmth to it. Bottle Design and Artwork: This is a standard vial / imp size (1/32 oz). The label wrapped around the bottle features an Art-Deco inspired Phoenix with the the name of the company at the right-hand side of the label. The other side is a bit different since this is an imp specifically from a special collection. It features the words in a grey color that read “Peter S. Beagle’s The Last Unicorn” at the very top. Just below that in a kelly green field box is white text that features the name of the scent. Along the outermost side, written down the side is the web address of BPAL. 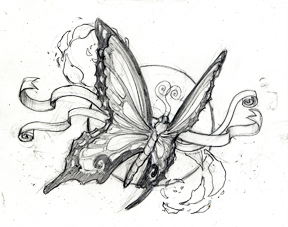 The image is a beautifully rendered pencil drawing of the butterfly with its back turned to us. In the Imp (ITI): Ugh, sharp petitgrain with tonka. It smells like green foxtail stickers. Wet: It’s much more behaved with with a balance of the petitgrain with strong bergamot, amber, and tonka. It does remind me of the gentle and delicate texture of butterfly wings. Dry: It’s much better dried. It’s mostly brown, fuzzy tonka with amber and bergamot. I’m relieved! Oil Color: An oranged honey color. In the Imp (ITI): On first sniff, I quickly put the bottle down and walked away. I don’t know what it was about the first impression that turned me off, but the notes should have been appealing. Vetiver and really sharp lavender on second sniff. It’s overpowering. Wet: It’s wet, musky, and slightly moldering, which must be the vetiver paired with the musk. I get a little lavender, but it reminds me of lavender dust. Dry: It’s much better dried – Strong violet and musk with a hint of smoky lavender. Oil Color: A mulled orange color – slightly ruddied, but still orange. In the Imp (ITI): Wow, strong leather followed by vetiver and cinnamon. This paints a picture of a rogue clad in leather riding down a forested trail. Wet: Wet, smoky vetiver and leather are most dominant, with hints of jasmine peaking through. Dry: The scent stays true to its wet notes, never straying from the leather and vetiver. It’s truly a masculine scent. Oil Color: A candied orange color. In the Imp (ITI): I smell leather, juniper, dragon’s blood resin, and mulled wine in that order. Wet: Mulled wine is very much making its presence known. I can smell some juniper underneath, and just a little resin finishing it off. Right now, it reminds me of mulled spiced rum. Yum! Dry: The dragon’s blood now seems like the primary scent, toned down just slightly by the mulled wine. I can smell hints of leather cured in juniper berries and damp woods. I’m still adoring it! Other Impressions: Given my track record with wine, I should not like this, but it is just fabulous. I want to roll around in it like cat nip. Tony thinks it smells like mulled spices and orange peel, which he likes. Oil Color: A lovely ruddy brown. In the Imp (ITI): Cinnamon leaf, patchouli, incense, paired with lilies and jasmine. It’s heady and seductive, although I get the impression or marzipan for some reason. Wet: It’s very similar to in the bottle, but I get bergamot and saffron together…which seems to be making it smell like marzipan to me. Dry: Now, I get lilies, cinnamon leaf,jasmine, and patchouli. I don’t get the marzipan anymore, thankfully. However, there is just something I don’t like about it for some odd reason. Other Impressions: The more this dries, the more I rethink my initial opinion. After 5 hours, The sandalwood is light and the saffron paired with the cinnamon is comforting. Hmm, I may need to keep this. Scent Description and Notes: “The unicorn lived in a lilac wood, and she lived all alone. She was very old, though she did not know it, and she was no longer the careless color of sea foam, but rather the color of snow falling on a moonlit night. But her eyes were still clear and unwearied, and she still moved like a shadow on the sea. Oil Color: A cheerful yellow color. Bottle Design and Artwork: This is a standard vial / imp size (1/32 oz). The label wrapped around the bottle features an Art-Deco inspired Phoenix with the the name of the company at the right-hand side of the label. The other side is a bit different since this is an imp specifically from a special collection. It features the words in a grey color that read “Peter S. Beagle’s The Last Unicorn” at the very top. Just below that in a kelly green field box is white text that features the name of the scent. Along the outermost side, written down the side is the web address of BPAL. 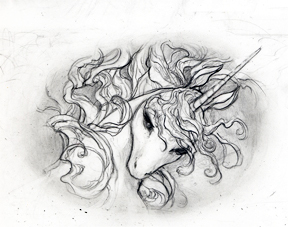 The image is a beautifully rendered pencil drawing of the Last Unicorn. In the Imp (ITI): White chocolate hits my nose first, but followed closely by the lilac, iris, and violet, I actually find the chocolate appealing. Wet: Lilac, white chocolate, violet, and light sandalwood. It’s warm and inviting while being feminine and not overtly foody. Dry: Violet is now running the show, which I adore. It is followed by the white chocolate orris, white sandalwood, and a touch of lilac. It’s nicely balanced. Other Impressions: Tony really couldn’t pick any single note out. Oh yeah! These notes together should be great. In the Imp (ITI): Sweet red rose in full blossom. The leather isn’t evident at all, but I don’t mind too much. Wet: Lovely red rose still, but now I get the impression of leather as well. I wish the leather was stronger, but I still really like this. Dry: Faint rose and a touch of leather. Oh, I wish there was more leather. Oil Color: A fiery orangish red. In the Imp (ITI): Smokey dragon’s blood resin is present, although a bit overshadowed, by the honeyed vanilla. It’s certainly intriguing, though. Wet: Think honey and amber with a faint touch of smoke from the Dragon’s Blood resin. Dry: Delicious resin and a combination of honey and vanilla that makes to resin alluring and manageable. Oil Color: A thin saffron color. In the Imp (ITI): Rich and ripe tropical fruit followed by heady florals and something that’s just a little soapy and odd. Wet: It smells a little like rubberized tar for just a couple seconds, but then I get tropical fruit and an aquatic tone to the mountain breeze. Dry: It’s not very long lasting. I tested four scents about 5 hours ago and this one I can’t pick up at all. Retested freshly dried, the fruits and florals have overcome all the astringency and chemically qualities of the other note, leaving a soft powderiness I can attribute to the amber. In the Imp (ITI): Sweet berries and peppermint snow just a dollop of pine. I’m barely getting any of the listed notes other than the snow. Odd. Wet: I still get that minty snow and pine combination, although I am getting the fainest impression of lily. I like this if it doesn’t change. Dry: As it dries down, the florals become more evident. It’s slightly soapy and it smells like thick lilies with just a touch of vanilla’d snow. Oil Color: A brilliant golden orange color. In the Imp (ITI): While the description is vague, I clearly get red wine, followed by fig, and a touch of resin. Wet: Lots of red wine, but almost rancid. I get fig or something deliciously dark and just a hint of resin. Dry: I get sweet myrrh and frankincense supported by light red wine and something “darker.” It’s interesting, but the wine throws it off for me. I hadn’t even heard of this scent before from Black Phoenix Trading Post, subsidiary of BPAL. However, the notes look promising. Bottle Design and Artwork: This is a standard vial / imp size (1/32 oz). This is a decant, although with no decanter information. It has the notes o n back and the name and collection on front of a taped label. ITI: Wow, it’s a very cool scent. I get coconut and cucumber – nummy. Wet: Hmm, it’s sweet and slightly green from the cucumber. The tonka and teak are a neat combination with the coconut, which emerges stronger as it dries. Dry: It’s muskily sweet – coconut tonka, and teak with just a hint of cucumber. Sadly, the sage never shows, but it’s still a wearable foody scent with a bit of intrigue to it. Other Impressions: Tony claims that it smells like suntan lotion and celery, although really faintly. Oil Color:A light, blond oil color. Bottle Design and Artwork: This is a standard vial / imp size (1/32 oz). This is a decant from ralenth, who tries to match the bottle art to the art she provides on the imp. On the back, she has the notes of the scent in large, cursive font. On the side, she has her decanting name, while the front features the name of the collection and the name of the scent framing the image associated with the scent. The image is a shunga print a a man peaking at the beauty of his lady friend. ITI: The red brush tea is pretty clear on first sniff, followed by the sweetness of lotus and peach. It’s certainly a pretty scent. Wet: Hmm, spicy, clean, and berry-based, which I assume is front the teal. There is a luscious aspect from the peach and the myrrh offers a subdued spice that doesn’t overpower but balances the notes very well. Dry: I get myrrh, red brush tea, amber, and just a hint of fruit. It’s wearable and feminine. Other Impressions: My cats adored this scent. She dove under the covers to try and lick the scent. 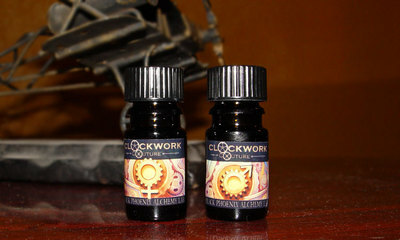 This is another scent from the clockwork / steampunk inspired line. Bottle Design and Artwork: This is a standard vial / imp size (1/32 oz). The label wrapped around the bottle features created by ralenth the scent notes on the back, her decanting name down the side, and the name of the scent with an image of female in a short, red dress petting a clockwork creature (something cat-like). The bottle image is a clockwork reinterpretation of the female sign. In the Imp (ITI): My first impression is that it smells like a sweet cologne. I get the vanilla orchid and the tonka muddled with amber and something that smells very so slightly of berries. Wet: Warm amber and tonka with brown leather that gently supports the orchid and moss. It’s rather pretty. Dry: Tonka, amber, deliciously worn and supple leather, with hints of vanilla orchid and moss. Wonderful! Other Impressions: “Light pumpkin and cream.”-Tony.